I think you all remember in my last Nature’s Co November beauty box article, I mentioned about Evening Primrose shampoo, though this is not a product of my beauty box. 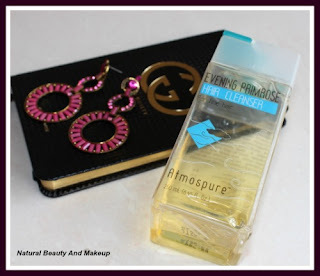 So today I have decided to share with you all the review of this hair cleanser, which is from Atmospure range. 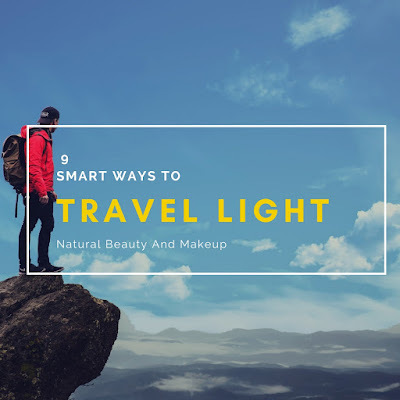 Over the years my tresses have shredded a lot due to various reasons (starting from bad diet and lifestyle of hostel life to using chemical laden hair products), which resulted into limp and shrimp dull fine hair with zero shine. 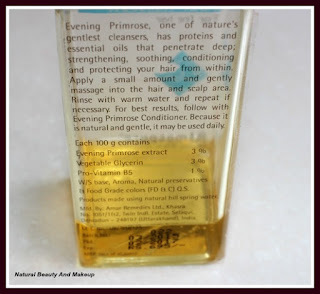 My quest for pure natural shampoos has come to an end certainly, but to know how much this cleanser fared for me, please read ahead. Claims:- This natural and gentle cleanser has Proteins and essential oils that penetrate deep; strengthening, soothing, conditioning and protecting hair from within. Product made using natural hill spring water. The packaging of Evening Primrose Hair Cleanser is very classy and stylish. The container is of transparent plastic, square shaped structure with a green colored flip flop cap. 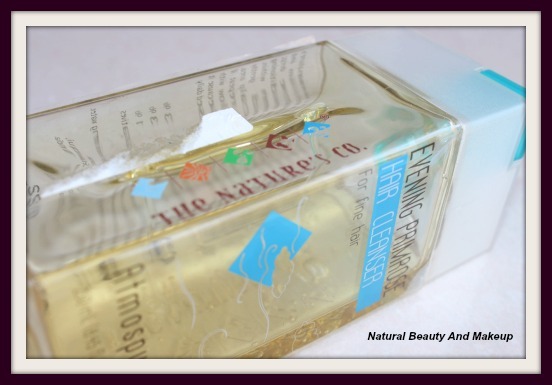 You can easily see the yellowish cleanser from outside of the bottle. The important details are printed on the bottle itself. 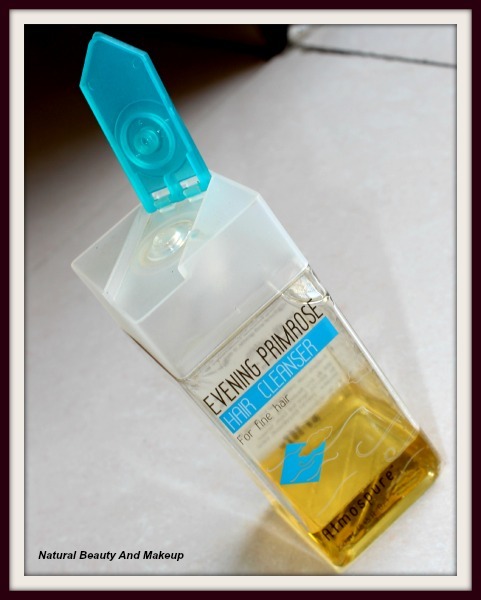 The color of the cleanser is transparent, though from outer side of the bottle it appears yellowish. The consistency is in the form of viscous liquid and has a pleasant fragrance which stays on the hair for some time. Before I start briefing my experience here, at first will let you all know that I have a combination type hair with an oily scalp and dry hair ends. One fine day I was looking out for some natural herbal shampoos online, only when this hair cleanser caught my attention!! People rave about Evening Primrose Oil and capsules for their immense health and hair benefits, and so I was convinced to try this. Moreover this is my first Nature’s Co product; I also bought Vitamin E conditioner from the same brand which will be reviewed soon. I wanted to experiment with this cleanser. So, to see the difference, sometimes I used it solo, (just wanted to check whether it’s sufficient to moisturize my hair & controls hair fall or not) and sometimes tried it with conditioners and on oiled hair. I often don’t get the time to oil my hair and sometimes skip conditioners too, so results are bound to be awful. The cleanser has proteins and essential oils in it, so thought to try this alone. The best part is that a small amount of cleanser is enough to clean the scalp thoroughly. It leaves a pleasant fragrance and the hair does feel fresh. Since my hair ends are super dry so I need to run for conditioner. It has no harsh surfactant chemicals such as SLS/SLES still lathers pretty well, adds volume too. If I get the proper time to pamper myself, I take a good time to massage my hair with hot oil at night and wash it on the next day. These days I am using MABH hair oil( Review coming soon). A combination of this oil and cleanser is paying off great. Though you need to rinse your hair twice in this case, but results are superb. A nourished, moisturized hair with squeaky clean scalp is all you get. I need to apply conditioner on the hair ends only, but even if I skip this, it works just fine. Hair fall has reduced considerably and growth is also quite visible. I normally use a little conditioner only on the dry hair ends, but with this cleanser, I needed to apply a good amount of conditioner. The cleanser alone is not sufficient to provide nourishment. I would say oil, cleanser and conditioner combo gives me excellent results rather using them solo. 2. Not ideal for dry hair. As I said earlier that I experimented a lot with this cleanser to see how far it is able to stop my hair fall issue, I got my answer “Perfect”. 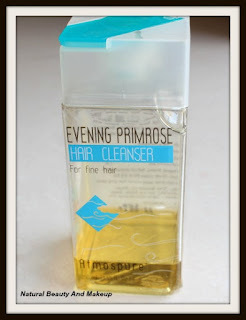 Because all previous shampoos of mine either failed to clean scalp build up or lessen the hair fall. But here it has passed with flying colours, so I would definitely say to all it’s worth a try!! Have You Tried This Hair Cleanser Yet? How Did You Find It, Good Or Bad? Do Let Me Know In The Comment Section Below. Number of beautiful tips to keep our texture shiny is made available in your blog. I wish most of your products to consist of squalane to moisture your skin. I am highly benefitted with your products.